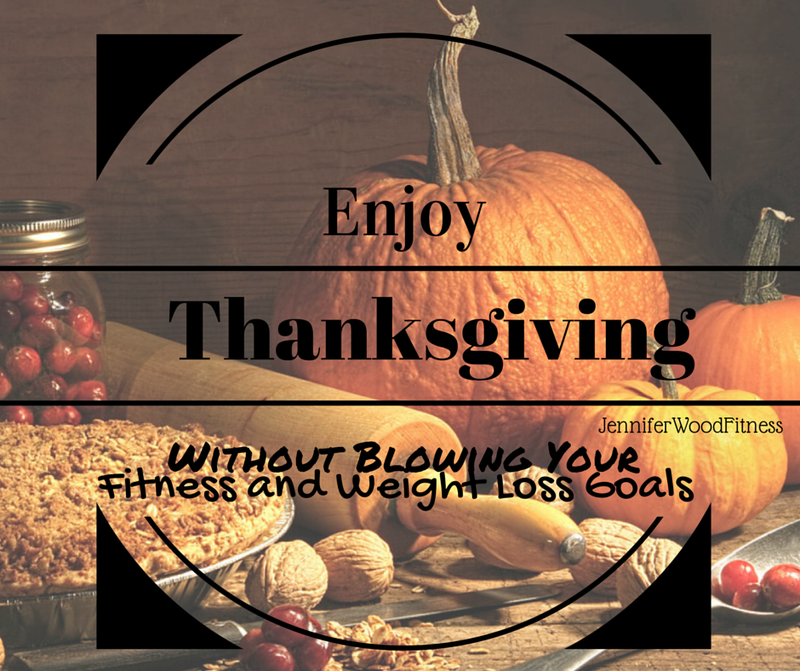 Jennifer Wood Fitness : How to Enjoy Thanksgiving Without Blowing your Fitness and Weight loss goals. How to Enjoy Thanksgiving Without Blowing your Fitness and Weight loss goals. How many of you completely fall off the fitness wagon around the Holidays. I know that used to be me and then I would get back into it in January. Now, I just indulge occasionally during the Holiday season, but make sure to eat clean (avoid processed foods) most of the time. Making sure to eat breakfast and not skip meals, so you keep your metabolism higher and burn more calories. Workouts are a must. Even if its just a brisk walk 4-5 times a week. The best thing to do is a combination of cardio and strength training. Especially if you are over 30, since we lose muscle mass after the age of 30. The more muscle you build, the more calories you burn. Which = you can eat more food! YAY! Our calories tend to go up during the Holiday months of November and December, so you will need to burn extra calories if you want to keep that weight from creeping in. You can indulge in wine and pie and still get results. Try the following tips and video to help stay on track for Thanksgiving and Christmas and check out my upcoming Support group for added accountability. Check out Autumn Calabrese's Video on Surviving Thanksgiving. You can even use your 21 day fix containers to help you portion control your meal. Need a place to plug into for daily support and accountability during the Holidays? Apply here for access to my Elite private Facebook Accountability Group.